One of the perks of living in the Fraser Valley is being able to enjoy the abundance of fresh corn grown in the area. This year, Lepp Farm Market in Abbotsford grew 120 acres of non-GMO sweet corn, which was picked by hand, and sold at their Farm Market store and distributed throughout the Okanagan, Vancouver and the Sunshine Coast. The farm is owned and operated by Rob and Charlotte Lepp, but it began a generation before with Rob’s parents. All the products they grow can be found in their store, which will be entering its sixth year this November. The couple believe in connecting with their customers through a farm-to-consumer approach. In fact, their store is not just a regular grocery store. Inside, they have a restaurant, offer cooking classes and hold events throughout the year, such as the Corn and Peach Festival in August. Charlotte offered some insight and fun facts about everyone’s favourite vegetable, corn. You may have noticed that this year’s corn seemed sweeter and juicier than usual due to the unseasonably warm weather. While the hot, sunny weather helped speed up the ripening process, it meant that the corn probably won’t last as long and corn season will be ending soon. Luckily for the Lepps, they have a good irrigation system for their fields. But as Charlotte mentions, irrigation is costly both in money and labour, and those unable to irrigate would have had a tough season this year. With the season ending soon, it’s time for corn to go out with a bang! 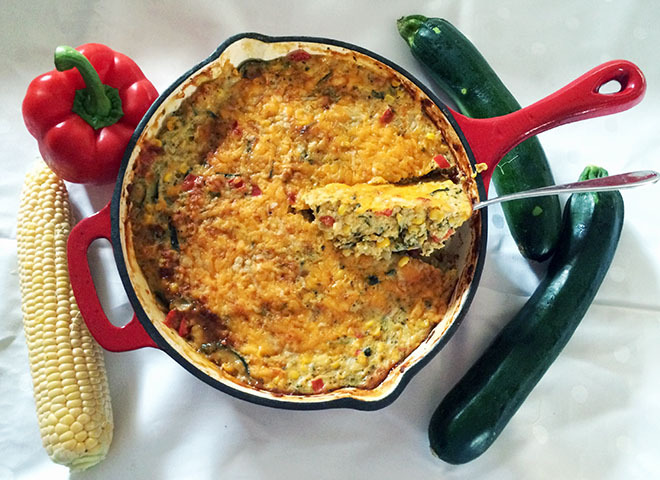 If you’ve been eating corn all summer and are getting a little tired of the usual boiled corn on the cob smothered in butter, check out the recipe for a sweet corn and zucchini pie below from the Farmer’s Table Café, as explained by Charlotte Lepp. Also, a few sprigs of fresh oregano and/or thyme leaves stripped from stems and lightly chopped (you can also substitute 1 tablespoon of each, dried), or use cilantro for a Mexican meal. Heat the butter in an ovenproof deep skillet over medium-high heat. You’ll need at least a 9-inch diameter. This is a great way to use your cast iron pan as you can bake it right in the pan. Add the onions, zucchini, and diced pepper. 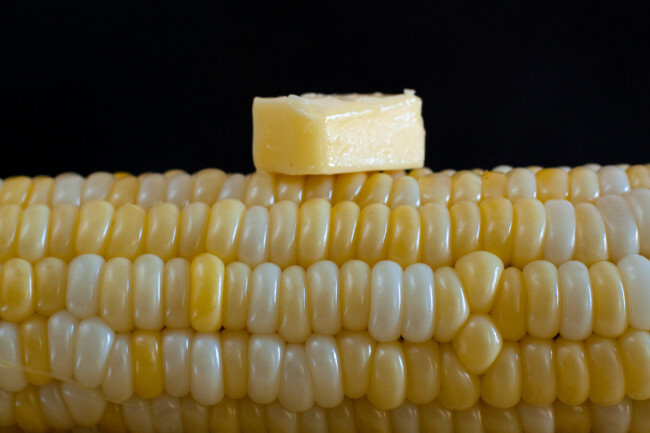 While the veggies sauté, cut the corn kernels off the cob. Add them to the pan and continue to sauté until the veggies are soft (5 to 10 minutes). Remove from heat. Add the fresh herbs and salt. Stir once to combine. Take off the heat and allow to cool slightly so you don’t end up with scrambled eggs. Add the cheese and the beaten eggs to the veggies and stir gently to combine. Arrange the top so the zucchini slices lay flat and look nice. Top with a little extra cheese for looks, cover with greased foil or a lid and bake for 20 minutes. Remove foil and bake for an additional 5 minutes to brown the top. Hours: Open seven days a week, 9 a.m. to 7 p.m.